​This is our 14th year in business and to celebrate we are going back to our roots. revisiting that theme this year. So we will be taking from the past and starting new and exciting events for 2019. This will not be your ordinary cookie cutter, everyone making the same exact block, Sampler. ​Every month you will choose your own fabrics from our rich Civil War palette. With every block you will learn to combine your choice of tones, work with shading and value to design your own ONE OF A KIND Sampler. What are we keeping the SAME? You will be given all fabric needed for the quilt in February, so that you may choose your own fabric combinations each month for each block. We will be starting just a bit later than previous years so that we can allow time to set up the POT LUCK table. Then when our class is over, we will have a proper time to eat, socialize and share the uniqueness of your month’s block. What better way to get to know each other than eating together and talking QUILTS? Although each participant will receive the same 25 Civil War reproduction Fat Quarters, it will be so exciting to see what colors you picked and how you chose to combine them to make this quilt uniquely your own! There is no finishing kit and you will be receive all of the fabric (almost 15 yards) to make this queen size 90” x 90 queen size quilt at the first meeting. The cost of the SSS 2019 Homestead Hearth is $165. Sign up early for best discount! In celebration of the friendships made in our 13 years since opening Bless My Stitches, we are naming this year's SSS... BFF - Best Fall Friends! make this quilt a show stopper! to complete all 25 blocks. *Seats are limited, sign up TODAY! *Begin the new year with a new quilt! *Featuring AGED MUSLINS by Marcus in warm tones of blue, brown, olive and gray. *Twelve blocks are set on point against cream for a fresh effect. *AGED MUSLINS offer a great alternative to true solids, with an aged appearance that lends itself to a range of decorating styles. 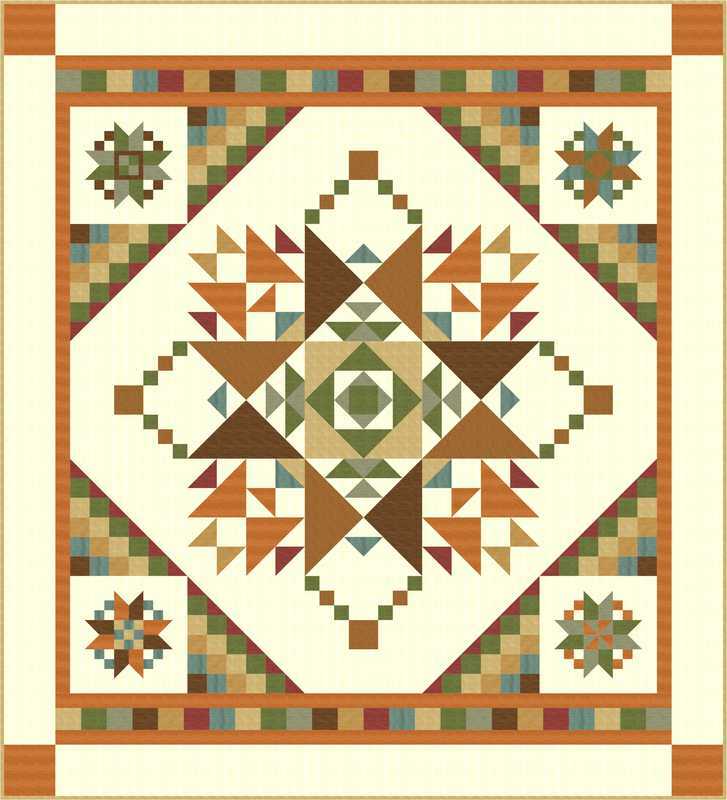 *We will be offering a setting kit, if you would like to finish your quilt like our sample. Measures 82" x 98"
​Welcome to our 10th Annual Second Saturday Sampler. In keeping with the Amish tradition we will be using solid jewel-tones on solid black. This makes for a very stunning quilt! 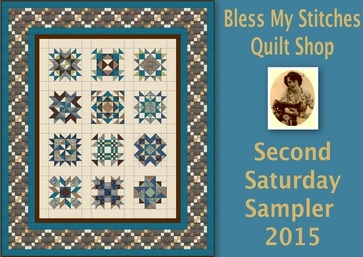 We will also be offering a setting kit if you would like to finish your quilt like our sample. Click here for your informational flyer. Well, 2015 is coming to a close and I had a wonderful time of teaching and fellowship! Thanks to all the lovely ladies that made it so special!! 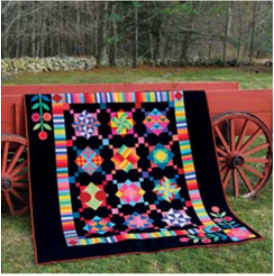 If you could not join us and are interested in this gorgeous quilt, we will be putting together kits this winter. Call the shop for info at 828-835-4900.